In the wake of distressing news of James Foley's murder this week by ISIS terrorists, I venture critically to visit the concept of Team Australia, a phrase launched by the Prime Minister a few weeks ago during the debate on weakening the anti-racial vilification laws, and in recent days revived in the context of proposed tougher new anti-terrorism laws ('everybody faces the choice now whether to join Team Australia'). Team Australia, as the term is employed by the Prime Minister, is the antithesis of multicultural Australia. No amount of explanatory glossing or qualification ('whatever your background, we want you on Team Australia') can escape the fact that the term divides people into Us and Them. It postulates that the world is a competitive environment of nations that win or lose. We are being encouraged to get on the winning team. Games can be friendly or unfriendly, but they are unavoidably about winning or losing. You can't belong to Team Australia and at the same time belong to Team Italy or Team China or Team India , or even Team Israel. You can't play for Team Australia and play for Team Islam or Team Hinduism, because Australia is a Christian (or occasionally a Judaeo-Christian) society. You have to choose your primary loyalty or affiliation: 'He who is not with us is against us'. The more one unpacks the term Team Australia, the nastier it gets. The wisdom and humanity of multiculturalism is that it recognises the reality that people's loyalties and affiliations are complex and often contradictory. We live with and celebrate those contradictions. For example, by virtue of my birth, citizenship and ethno-religious background, I could be said to belong to Team Australia, Team Christianity, Team Judaism and Team Ireland. I'm still not sure if I am on Team Labor or Team Greens, and probably never will be now. Abbott has recently reminded us that he also belongs to Team Britain, or perhaps more accurately Team England (his birthplace and source of political values) in his emotive and unhelpful entry into the Scottish independence referendum question. He showed there a remarkable ignorance of the serious and responsible nature of that vital debate in Scotland – a source nation for many Australians – and its possible outcomes. This did not stop him barracking aggressively from the sidelines for what he imagines to be Team Britain: a concept of a nation that no longer exists except in Abbott's own sentimental, 'Boys' Own' imagination. An irony in this is that, having recently been walking in Scotland for three weeks, I thought I recognised more recognisable 'British' traditional values there, of compassion, fair play and social justice, than in the frenetic, distracted, money-driven culture of London and its surrounds. As for me, my membership of Team Ireland has led me naturally to side with Team Scotland in the coming referendum. Had I a vote, I would vote 'Yes' for independence. All this might suggest how intellectually and morally limiting the 'Team X (insert your preferred term)' terminology quickly becomes. My core values tell me that if I had to choose just one team, I would choose to play for Team Humanity. But that term itself trivialises and debases the seriousness of these matters. It turns us all into flag-waving fools. Because of the fraught global context in which we now live, in a world where Islamic-based extremist fundamentalism has become a terrifying reality in several countries, we need to be especially mindful and respectful of the hurt and harm this phrase is causing to Australia's diverse Muslim communities, many of which go back many generations. Abbott's breathtakingly insensitive words and actions were demonstrated last week, when he invited Australian Muslim community leaders to a meeting to discuss anti-terrorism law. The revelation that his government had already drafted bills in detail, which Muslim communities were expected to endorse, led inevitably to a boycott by many of those leaders, who rightly complained it was not a serious dialogue but just a public relations stunt. This boycott provided the opportunity for savagely bigoted 'news' coverage by the Daily Telegraph which juxtaposed images of ISIS terrorists about to behead victims with that of Australian Muslim leaders, some of whom were wearing turbans. The general message to readers is that Australian Muslims were – yet again – refusing to join wholeheartedly in the national fight against terrorism. And that article, in turn, provoked a torrent of hate-filled and abusively Islamophobic reader comments which were published. I can only imagine and try to empathise with the distress that the article and reactions to it would have caused in Australian Muslims. This, I suggest, is where Team Australia rhetoric leads us: to a thoroughly ugly place. The term hurts and divides, rather than unites, our national community. The Opposition is forced to say that it, too, supports Team Australia. Anyone who does not express loyalty to the concept is, by that very fact, marginalised as disloyal or potentially disloyal. These days, I sometimes find myself falling into the trap of thinking in such divisive categories: of the Compassionate Australia Team that feels and expresses deep distress at the cruelties our nation is inflicting on innocent boat people families, and the Hardheaded Australia Team that claims those huge cruelties are necessary in order to deter other boat people from coming. I am losing my sense of a national community of shared civic values, and I am struggling to hold onto the belief that it is possible to persuade fellow Australians away from prejudice and deliberate cruelty to our fellow human beings: that there is actually a wide spectrum of views, and the task is to move enough people to make a political difference along that spectrum towards compassion and decency. It's time to expunge Team Australia from our political vocabulary. Tony Kevin is a former Australian ambassador to Poland. Image via the Sydney Morning Herald. Thanks Kevin for expressing the outrage appropriate to the ugly terminology. We are not a team we are a community, a nation. The competitive and excluding overtones of the phrase are in line with the bread and circusses rhetoric and behaviour of the current government. If the leadership talks like this and appeals to baser values can we be surprised that non thinking bover boys in the burbs will follow? Oh, and just by the way, whose Pope does Abbott say is his leader? Surely not the current Pope who is concerned about how humans treat other humans, how they put economies ahead of people and how they distribute wealth and food. Could Abbott be a schismatic? Keep the people poor, and keep them racist. These Liberals arn't even being good neo-liberals. Just front men for the landed gentry and the masters in the USA. Looking at the illustration of our Blessed Cabinet at the top of the page, plus Peta, I must say I would not want to be on a team with the likes of them. Uncle Eric Abetz is missing but he should feature too. You would need a good chain mail shirt to protect from back stabbing from that lot. Thank you Tony for your wisdom. Regarding Team Australia I am reminded of Upton Sinclair who said the next time Fascism comes it will be wrapped in the flag and carrying a cross. People get the governments they deserve, and deserve the governments they get. Oh Australia, why did you deserve Tony Abbott? What a shockingly disrespectful place we've come to, led by a man who doesn't truly understand Australian values or even our way of life. Let him be gone, and soon! I love the artwork! ES, there's an opportunity here for reproducing it as fridge magnets, tea towels, bumper-stickers, coffee mugs, stubby holders and whatever. You could make a fortune from it! Take a cup of racial bigotry and another of political prejudice. Add a heaped tablespoon of sanctimony. Allow the mix to simmer and the result is "Flag-waving foolishness that divides". Tony Kevin champions multiculturalism : provided it contains no Anglo-Saxon element. Perhaps he sees Anglos as sub humans devoid of decency, compassion and any sense of fair play and social justice. That's his prerogative, but it does seem a little harsh on men such as Thomas More and John Henry Newman. But perhaps most worrying is his apparent unwillingness to recognise the unique essence of Islam : not just a religion, but an ideology and an entire system of life -- political, legal and cultural -- wherein there can be no peace until all non-Muslims subjugate themselves to it. For two decades, thousands of Muslim terrorist incidents have occurred worldwide, and now thousands of Muslims from multicultural Western countries have joined this evil. The latest country to express concern is Austria whose Interior Minister stated that support for radical Islamists was on the rise. She urged zero tolerance and said "We need to close ranks across Europe in the fight against terrorism and jihadism." Yet the more frequent, barbaric and widespread Islamic terrorism becomes, the deeper the Left buries its head in the sand. But then the Left has a long history of appeasing tyranny, even applauding the Soviet/Nazi Pact of 1939. The historian Robert Conquest spoke of Soviet disinformation thus: “(Stalin) knew that even though the truth may be readily available, the deceiver need not give up. He saw that flat denial on the one hand, and the injection into the pool of information of a corpus of falsehood on the other, were sufficient to confuse the issue for the passively instructed foreign audience, and to induce acceptance of the Stalinist version by those actively seeking to be deceived.” Today the Left are the apologists for Islamic barbarism. Are they all just gullible fools, or knaves perhaps? Thank you Tony for so eloquently articulating what I feel in my heart but have not been able to find the words to express. 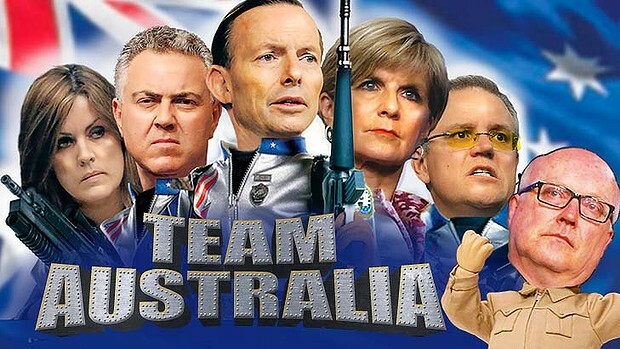 "Team Australia" is the most devisive and incidious marketing tool this government has employed. I can tick almost all of the entry requirements to join Team Australia however I am a woman, and by virtue of that twist of biological fate alone, I am precluded from being on this "Team". Imagine if I also belonged to other religious, ethnic, socio-economic (or other) Teams as well. How extra-marginalised I would feel !! Von, it could be that the PM has a deep understanding of Australian values. He understands exactly what that pretentious term 'Un Australian" means when publicly used by such luminaries as sporting stars, Murdoch columnists and polies from all sides. That is why he is Prime Minister. No grebo, Von has it exactly right so has Tony Kevin, thank you Tony, great article. The term 'team Australia' is nauseating but don't be fooled by Abbott, he uses it deliberately. It's not a mistake. He's pandering to the red-neck, right-wing element that is his support base . This is a man who thrives on division as he knows no other way. I share much of Tony Kevin's frustration and dismay. I think back to the wonderful celebrations at the beginning of 2001, marking the centenary of Federation. As Australians, we rejoiced in being a multicultural society. Then came the terrible events of September 11. It seems to me that a whole series of events and misguided stances since then have done nothing to improve the global situation, but in our case have only diminished us as a nation. It is only when we recognise that we belong to one human family will there be peace in our world based on justice, equity and a recognition of the innate dignity of every person. To achieve unity in diversity we all need to have a willingness to dialogue which must include an openness to other points of view. I don't see much of all this reflected in Team Australia. Sporting analogies work in Australia. Most Australian men, those who read the tabloids anyway, read the sports pages first. Sometimes sport even dominates the first page of the capital city dailies. Being a member of "Team Australia" is a term Tim Fischer used to describe his duties as Australian Ambassador to the Holy See. I can't imagine what team the Secretary of State for The Vatican might have claimed to be playing for. How could he since he was (I hope) not engaged in the game of Realpolitik? I think a better and more honest analogy for Abbott would be "I'm fighting from the Blue corner, who's with me against those parasites in the Blue corner." Democratic politics in a pluralist society is based on competition. Politics within Australia is combative. The moral test of a political leader is to recognise that this calls for ethical behaviour. It is not moral to seek to accrue the captaincy of a majority of Australians by claiming to represent the embodiment of all that is true and good. There is a little bit of good in worst of us and a little bit of bad in the best of us. Box fair. Tony Kevin said "I am still not sure if I am on Team Labor or Team Greens and probably never will be now". I am sure many migrants who came to Australia after world war 2 and now are proud and loyal Australian citizens, love Australia and are proud of our national flag of 3 Crosses of St George, St Andrew and St Patrick, because Australia is a Christian country and will always be. The also definitely are "Team Australia" and they might suggest which Team Tony Kevin Should be. Why so much hate towards Tony Abbott and the Conservative parties? Surely not from Christ's Faithful? @Ron Cini I wondered if you were being saracastic when you asked why people are so distainful of Tony Abbott I have come to the conclusison that you cant see beyond your blinkered view. Your standpoint seems to be that Abbott and company can do anything they want - as long as you arent effected. Jesus did the same thing of course which is why he is so admired so long after his death. Multiculturalism in Australia is like a rainbow, with each colour retaining its distinct colour yet striving in unison to arrive at the same pot of gold. Now I call that "Team Australia"